Barclays Center is committed to connecting with the community and providing college students an opportunity to attend basketball games, hockey games and other events at an affordable price. 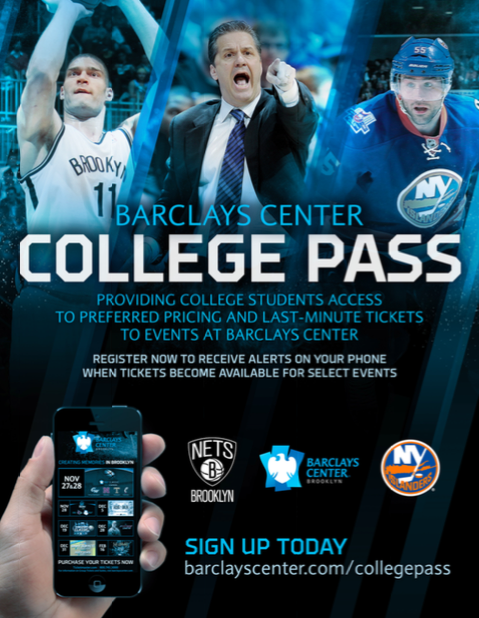 We’re proud to announce Barclays Center College Pass, and we hope you’ll share this with your students. It's a great way for hard-working students striving to pursue their academic goals to be rewarded for their efforts. College Pass offers preferred pricing and last-minute tickets for graduate and undergraduate students through a text-alert system. They'll be notified when tickets become available to select Brooklyn Nets, New York Islanders and Barclays Center events. Attached, please find a flyer outlining the program. Feel free to share with your students.